Great images start with great optics. An SLR camera is often defined by the quality, breadth and scope of its lens system. As such, Canon lenses alone are reason to choose the EOS system. Combining some of the world's most advanced optical, microelectronic, and precision manufacturing technologies, EF lenses are known to be some of the best DSLR lenses with some of the top photographers. With over 100 million lenses produced worldwide, Canon EF Lenses have proven their worth in every photographic context. Canon's system of DSLRs, lenses and accessories empower you with the creative flexibility to make incredible images and movies. With lenses for beginners, advanced, and professional photographers, the ever-increasing sophistication of digital cameras and optics has opened up a whole new world of creative possibilities for everyone - from budding amateurs to professionals. Canon manufactures a variety of DSLR lenses for all your photography needs. Whether you need a Standard & Medium Telephoto Lens, Wide & Ultra-Wide Zoom Lens, Macro Lens, Tilt-Shift Lens, Telephoto & Super Telephoto Lens, or Refurbished Lens; Canon lenses offer some of the best DSLR lens quality. Zoom lenses cover a range of focal lengths, letting photographers travel light while staying creative. Wide and Ultra Wide-Angle Zoom Lenses allow for extreme compositions in landscape and interior photography, while Telephoto Zoom lenses take you closer to the action. Standard zooms cover focal lengths from wide angle to short telephoto, making them the top beginner lens great for everyday photography. If you're looking for a fast lens, the EF 16-35mm f/2.8L II USM ultra-wide angle zoom lens offers excellent optical performance throughout the zoom range. With an f/2.8 maximum aperture, this lens is ideal for low-light photography. If you're looking for one of the best ultra-wide lenses for travel, the EF 17-40mm f/4L USM is an ultra-wide-angle zoom that offers excellent image quality and a constant f/4 maximum aperture. 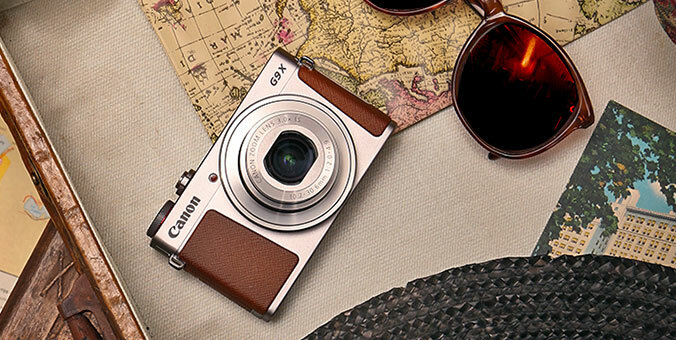 Its compact, lightweight body makes it an ideal travelling companion. For the professional wedding photographer or sports enthusiast interested in image quality, the EF 70-200mm f/2.8L IS II USM is a great choice. Pair that with the EF 24-70mm f/2.8L II USM for a versatile kit with f/2.8 maximum aperture. Macro lenses allow close-up photography of very small subjects, revealing details that can often not be seen with the naked eye. They are used by wildlife and nature photographers for images of insects and flowers, as well as by those shooting still-life images in the studio. With its large maximum apertures and light-weight, macro lenses are also a great option for portrait photography. To enhance the already stellar features of the EF Lens system, there are a number of accessories designed to perform perfectly with your lens. Canon offers lens cases to help protect your lenses, hoods, filters (which help control glare); plus there are a number of adapters to further expand the possibilities of your EF Lenses and your EOS System. The optional DSLR camera lens mounts give the entire line of Canon’s EF Lenses versatility, from a fisheye to telephoto and everywhere in between. With filters such as polarizing filters, the photographer is able to enhance picture quality by blocking undesirable reflected light. For use with lenses using rear-mounted drop-in filters this polarizing filter can be rotated from the outside without removing the holder from the lens, helping enable precise control. DSLR lens accessories can help your creativity move to the next level. Zoom lenses cover a range of focal lengths, letting photographers travel light while staying creative. Ultra Wide-Angle Zoom Lenses allow for extreme compositions in landscape and interior photography, while telephoto zoom lenses take you closer to the action. Standard zooms cover focal lengths from wide angle to short telephoto, making them the top beginner lens great for everyday photography. If you're looking for a fast lens, the EF 16-35mm f/2.8L II USM ultra-wide angle zoom lens offers excellent optical performance throughout the zoom range. With an f/2.8 maximum aperture, this lens is ideal for low-light photography. If you're looking for one of the best ultra-wide lenses for travel, the EF 17-40mm f/4L USM is an ultra-wide-angle zoom that offers excellent image quality and a constant f/4 maximum aperture. Its compact, lightweight body makes it an ideal travelling companion. For the professional wedding photographer or sports enthusiast interested in image quality, the EF 70-200mm f/2.8L IS II USM is a great choice. Pair that with the EF 24-70mm f/2.8L II USM for a versatile kit with f/2.8 maximum aperture. About Binoculars with Image Stabilization have high magnification with shake-free performance which enhances your ability to view fine detail and reduce eye strain and fatigue. With Optical Image Stabilization, you can enjoy the resolving power of binoculars without a tripod. Canon's Vari-Angle Prism (VAP) Image Stabilizer uses two sensors and a microprocessor to analyze the smallest tremble and to shift the prisms, instantly adjusting the angle of incoming light to keep the image clear and steady. Plus, Canon's Super Spectra coatings ensure vivid high contrast images with accurate color balance by eliminating unwanted internal reflections allowing a bright field of view in low light conditions. If you're interested in outdoor activities such as birding or hiking, the all-weather feature is designed to survive the toughest outdoor conditions. Select Image Stabilizer Binoculars withstand different waterproof durability; select models are fully waterproof or water-resistant and are designed to have easy-grip for wet conditions to withstand all your adventures. Other binoculars carry low-reflectance exterior and low gloss front covers, which helps to avoid disturbing birds and other wildlife. Canon's binoculars exemplify experience in precision optics and lens development. Known as some of the best reviewed binoculars, Canon continues to deliver high resolution and bright images, making it easy to locate your desired subject.